(P1) A new sweet potato won the 2016 World Food Prize. The sweet potato has extra Vitamin A. This means it has more nutrition. A researcher said farmers didn’t want to help him grow the potato. He said: “They told me it was a bad idea.” The farmers wanted more potatoes, not extra nutrition. 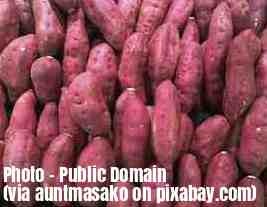 (P2) The sweet potato could stop people dying from not enough Vitamin This harms 140 million children in 118 countries. It affects millions of pregnant women. It also makes children blind. The prize-winning sweet potatoes could help people get enough Vitamin A. Maybe farmers will grow more vegetables with extra nutrition. Do you like sweet potatoes? Why or why not? Have you ever won a prize? If yes, what for? Do you think it’s a bad idea to grow sweet potatoes with extra Vitamin A? Why or why not? What prize did the new sweet potato win? How many countries are affected by a lack of Vitamin A? What can happen to children if they don’t eat enough Vitamin A?